It can treat everything from small lawns to sprawling commercial properties. It has the industry’s simplest, most intuitive controls. It holds a hill like no other machine. With its 3-in-1 tank, it can treat up to 132,000 sq. ft. Yet still fits through a 36-in. gate. 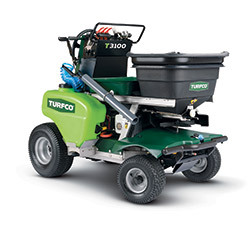 The industry-leading Turfco T3100.